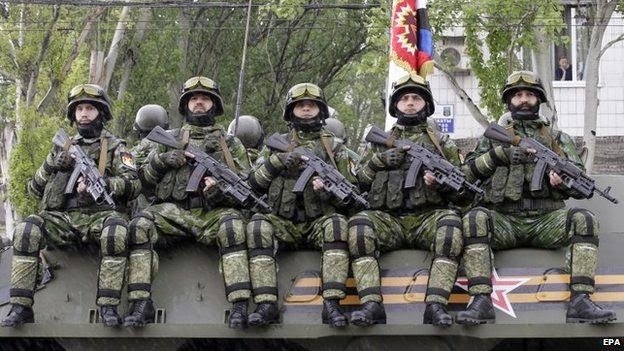 DONETSK, Ukraine -- The BBC's Tom Burridge has spent the past month in eastern Ukraine. Here is his snapshot assessment of the latest situation on the ground. These pro-Russian rebels, near Mariupol, are seen wearing Russian-supplied uniforms, carrying Russian arms and sitting atop a Russian military vehicle. Yet Putin continually denies that he is providing the rebels in Ukraine, with armaments and other supplies. No. There is fighting pretty much every day. It is nothing on the scale of what was happening around the time of the Minsk agreement, which took effect on 15 February. However, on certain days, in certain areas, the fighting has spiked. According to reports, neither side has sustained very high casualties since mid-February. However, on 6 May Ukraine's army said that five of its soldiers had died and 12 had been wounded in 24 hours. There has also been a significant amount of fighting south of Avdiivka, a town held by the Ukrainian army. In the region of Luhansk the fighting has been concentrated around the villages of Stanytsia Luhanska, Shchastya and Trokhizbenka. Both sides continually accuse the other of preparing a major offensive, and of using and building up heavy weaponry near, or on, the frontline. One significant fatal incident, intentional or otherwise, could act as a spark for the war to escalate again. The International Monetary Fund (IMF) predicts that Ukraine's economy will contract by a staggering 5.5% this year. Without more significant support from its allies in the US and Europe, Ukraine will struggle financially to take the fight to the rebels. The economic picture is also bleak in rebel-held eastern Ukraine. Many young people have left the region, so the working-age population has shrunk. A disproportionate number of elderly people have not been receiving their pensions from Kiev. A fresh rebel offensive could change all that. Hawkish voices in the US Congress have already pressed President Barack Obama to make a more decisive contribution.